Dan Hucko, Vice President, Corporate Communications and Investor Relations, Harris Interactive Inc.
Peter Holloran, President, Cognitive Marketing Inc.
Thomas J. Miller, Product Marketing, Director, Newport Corporation, Inc.
'The big idea: As a business leader, you know that every company, object, service, person or pet hoping to compete for public attention needs a brand. An enormous cottage industry has grown up around creating and improving brands, making it increasingly harder to cut through to useful, actionable information to help position your company’s products or services in the market. It should come as an enormous relief, then, that just about all the information you need has been compiled in a single book. The second edition of Brad VanAuken’s Brand Aid includes everything from a basic introduction to brand management to advice on leveraging and measuring your brand’s success. 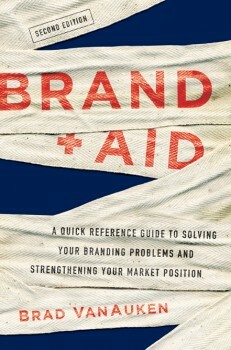 Brand Aid is available at Amazon.com and BarnesandNoble.com. A good article should include all the relevant data for the topic in a gentle way so that the readers can get your thought easily. In this article, you have arranged all your ideas in a pleasant way. I am really impressed with that. I like to refer your site to get good topics to read. Almost I have all your posts and this one is the best. This article has clarified the ideas in an interesting way. I have got a good writing structure from your articles. I am a writer at best essay writing service so that it is very helpful for me in my carrier. Keep the same quality in the rest of posts which is the best thing I have got from your articles. Thank you.